Xeryon offers different levels of precision, from our Original series with a resolution of 1.5 µm, up to our Ultimate series with a resolution of 10 nm. 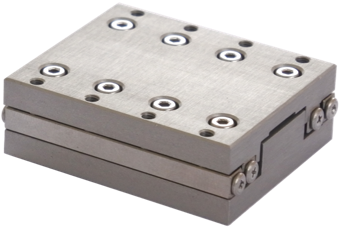 For each model, additional options are available – for example, high vacuum compatibility, making the stage the perfect solution for your SEM or your vacuum chamber. With the optional extra small cage, we can get even more travel distance from our stages, driving the volume vs stroke ratio to the limit. Of course, Xeryon linear precision stages also benefit from the same advantages as our rotary stages. Thanks to our Crossfixx™ technology, the stages are self-locking when in position, without any vibrations or energy consumption. 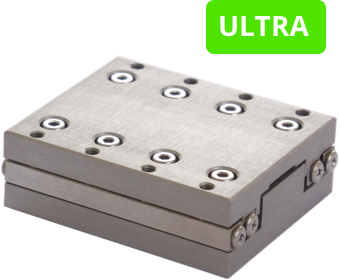 The ultrasonic technology prevents the typical unpleasant sounds associated with most piezo motion systems, rendering ours completely silent. All of our stages (rotary and linear) can be combined to create additional axes to suit your needs. The stages are easily mountable and custom brackets can be made if needed. If you can’t find exactly what you need in our standard product range, contact our engineering department for customised solutions. Check our custom project section for more information.